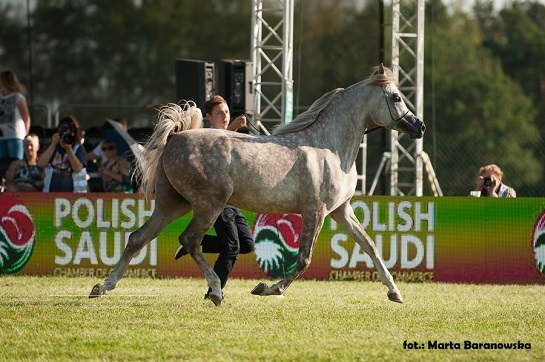 It is for the third time that the Polish AKF Stud organized the International Class B Show. And for the third time Nowe Wrońska welcomed us with wonderful weather (the organizers had to make a special effort as this summer was very capricious), great music, efficient organization, and most importantly, Arabian horses of the highest world quality. The guests of the Festival are likely to remember the outstanding performance of the snow-white, magical AJA Angelo and exquisite, bay AJ Sawari for a long time. The main prizes for winning the title of Champion were various models of Ford cars (B-Max, Kuga, Ranger). Vice-Champions and bronze medalists received prize money (PLN 8 thousand and 6 thousand respectively). The owner of the “Best in Show” additionally received PLN 15 thousand. Prize money of PLN 4 thousand was also given to the owners of horses which won places 1 – 5 in the individual classes. There was a great deal to be won and we saw as many as 106 contestants in the ring! Yearling fillies were the first on the ring. In group A we saw 11 contestants, two certainly standing out among the group. 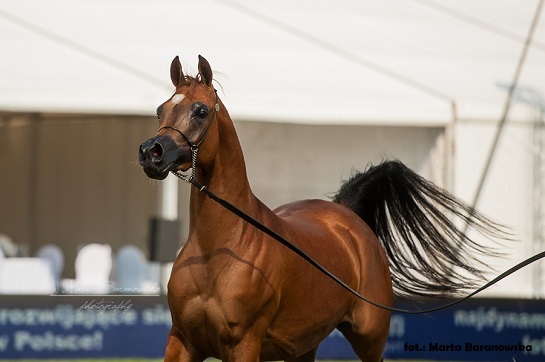 We refer to the representative of the Ajman Stud, the chestnut Aj Nurai (AJ Mardan – Ysadora/Marwan Al Shaqab), and a great mover, Michałów’s Emanolla (Vitorio TO – Emandoria/Gazal Al Shaqab). The fillies took the first two places. Aj Nurai won a total of 91.75 points while Emanolla slightly less, 91.63, but she obtained high scores for movement, one „20” and 3 x 19.5. The third place went to the bay H Emalee H (Jaipur El Perseus - H Emandia H/El Nabila B) with a score of 91.38 points. Participation in class B was equally high, with 12 fillies. Michałów’s Poganinka (El Omari – Pentra/Poganin) confirmed that great movement is the hallmark of Michałów-bred horses. The judges gave her as many as three “20s” in this category. Poganinka scored a total of 92.13 points, which gave her the first place in the class. 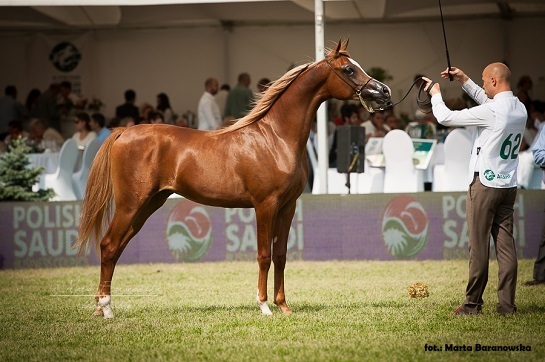 The immediate runner up was a representative of the United Arab Emirates, Manaret Babel (AJ Barzan – Munirah Al Bidayer/Marajj) bred and owned by the Babel Arabian Horse Stud, with a score of 91.50 points. The second runner up was Gaja Europa (Kanz Albidayer - Gaja Selene/Emigrant) of S.K. Chrcynno – Pałac with a score of 91.13. 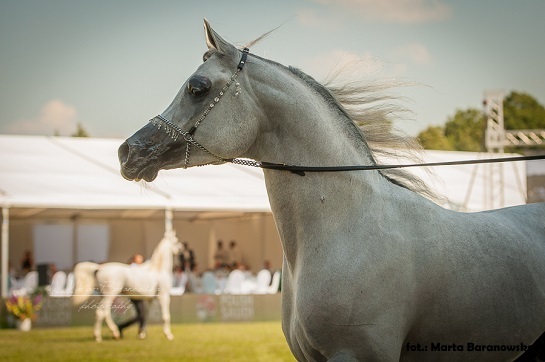 The lovely grey mare Malikat Al Moluk (Mameluk – Asalat Al Hala/Al Bilal) beat as many as 11 rivals in the two year old mares class. She won a score of 92.25 comprising „20” for type and two „20s” for head and neck. The filly represented Kuwait. 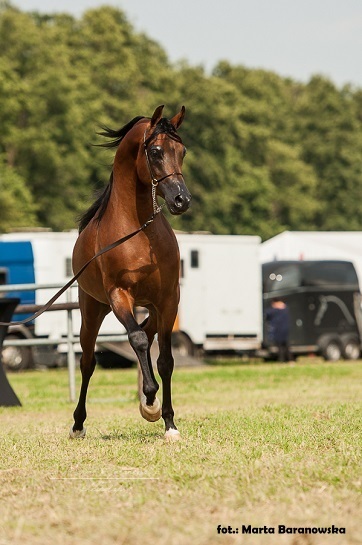 The runner up was a daughter of the stallion EKS Alihandro bred by Falborek Arabians, Wasalia (out of Wasa), to whom the judges gave 91.88 points. The third place in the class belonged to Michałów’s El Larinera (Empire – El Emeera/ Ekstern) (91.50 points). 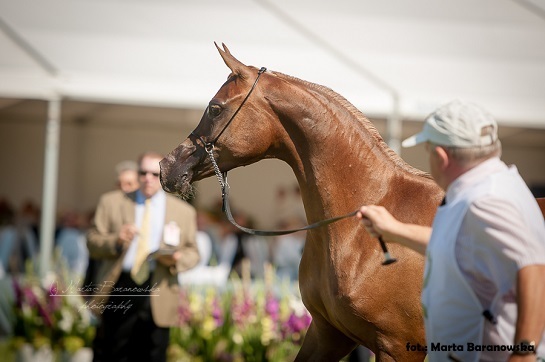 The performance of Aj Sawari (Marwan Al Shaqab - Siberia SA/Nuzyr HCF), no doubt a star in the three year old mares class and, as it transpired later, a star of the entire show, was a wonderful moment for us. The mare’s exquisite head certainly caught the eye and could not leave the judges indifferent; they gave this representative of the Ajman Stud three „20s” for head and neck and high scores for type (4x19.5), which added up to a total of 92.38 points and guaranteed victory. The second place went to Marina Tru (Trussardi – Melody/Psytadel) of Mr and Mrs Józef and Małgorzata Pietrzak. The mare won 91.63 points, the high scores for movement 2 x 20 and 2 x 19.5 definitely worth noting. She was closely followed by Paris J (Emerald J – Palabra/Enzo) bred and owned by Jadem Arabians (91.38 points). For a short while the mares then left the ring to the stallions. Both class A and B of yearling colts had six contestants. 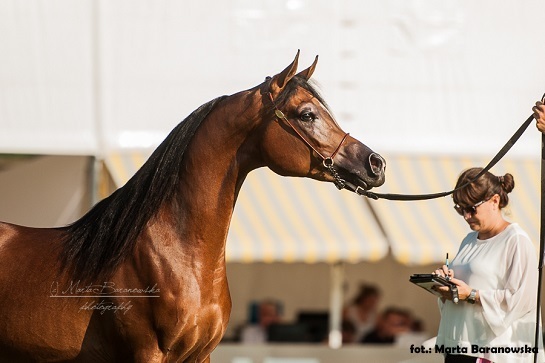 In class A the bay Cyclone OS (RFI Farid - Inspired Najla/Ajman Moniscione) bred and owned by the Gestüt Osterhof was invincible and laid his rivals flat with a score of 92.63. The runner up, with a considerably lower score of 90.13 points, was a Polish representative, Gaja Ramzes (Psyche Keret - Gaja Nike/Emigrant) bred by S.K. Chrcynno – Pałac and owned by Mr Krzysztof Poszepczyński. 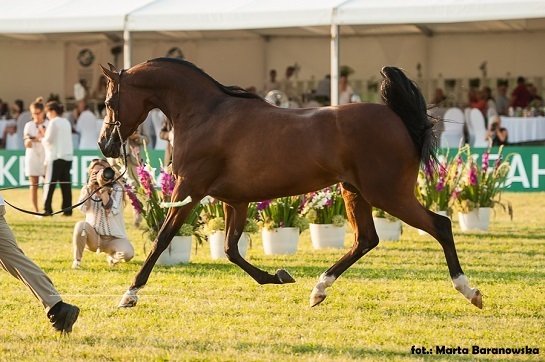 In class B the winner was Elidus (HK Krystall – Elidia/Pegasus) bred and owned by SO Białka. The foal won high scores for movement, including one „20” and 3 x 19.5. This translated into a clear advantage over El Shaad (FA EL Shawan - EL Estrada/Justify), who was second with the same total score of 91.25 points. We also saw six contestants in the two year old stallions class and, later on, in the three year old stallions class. Among the two year old stallions the clear leader of the stake was Fuerte (Shanghai EA – Frymuszka/Ekstern) bred by Mr Jan Dobrzyński and owned by Sami Ben Saad. Fuerte received 91.75 points from the judges. 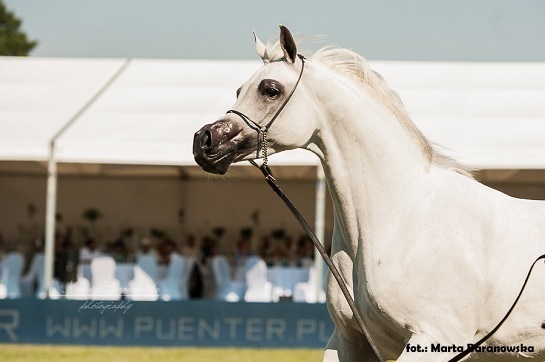 The runner up with a score of 90.88 was Primerius Emer (Emerald J – Poruta/Monogramm) bred and owned by Anna Damman & Katarzyna Dolinska-Witkowska (Zalia Arabians). The three year old stallions class brought victory to Shiraza de Lafon (Shanghai EA – Diacira/Khidar), who scored one „20” each for type and head and neck, and a total of 91.13 points. 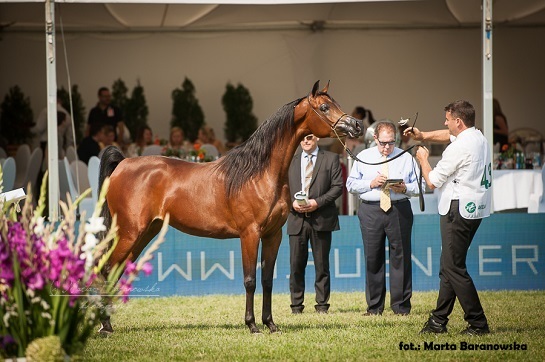 The runner up was Calateon (Vitorio TO – Calatea/Ekstern) bred by Mr Marek Kondrasiuk (90.75 points). Friday’s competition in the ring ended with 4-6 year old mares. The stake was strong and the rivalry promising. 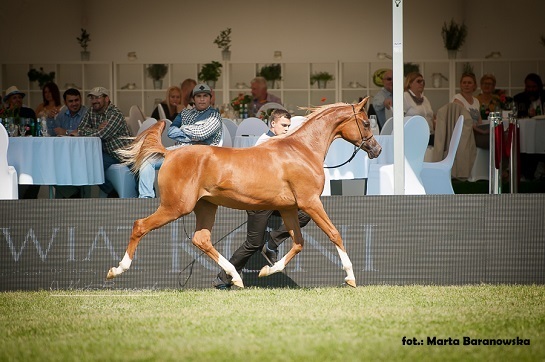 However, the strong group representing Poland had to step down to the Ajman mare Inspired Najla (Ajman Moniscione – Natalia/Narym) bred by Gerhard and Andrea Schick (Inspired Stud), owned by the Ajman Stud. The mare won high scores for type (4 x 19.,5) and for head and neck and movement („20” and 3 x 19.5 each). The total added up to 93 points! The second place went to the delightful Wieża Mocy (QR Marc - Wieża Marzeń/Ekstern). The Michałów-bred mare won a whole row of 19.5 for type and movement, which made up a total of 92.38 pkt. The third place was awarded to the grey Esima (Altis - Emanta/Pamir) bred by Falborek Arabians and owned by Mr Krzysztof Goździalski. Esima received a total score of 91.63 points including a „20” each for type and movement. The Saturday competition began with 7 year old and older mares. The best among the 12 ladies was the lovely-faced Felicia RLC (Shael Dream Desert - Camelia K/Donatello K). This representative of the Ajman Stud well deserved the full row of „20s" for head and neck and high scores for type: one „20” and three times 19.5. This added up to a very high score of 92.25 points. The second place went to the bay Marjjana VA (Marwan AL Shaqab - MI Khismit/Khemosabi) owned by Mrs Sylwia Napióra (Silvatica Black Arabians), the score being 91.25. The last in the top three was Białka’s Euspiria (Gazal Al SHaqab – Euskara/Ararat) who received as many as three „20s” for movement! Her total was 91.13. 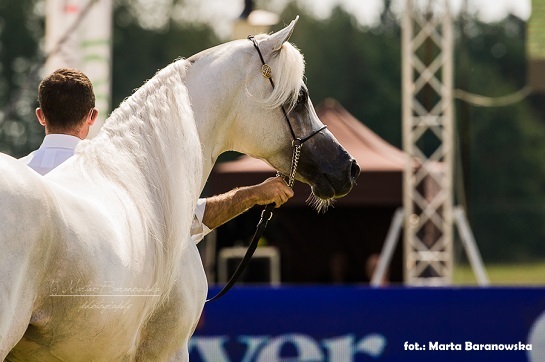 The judges gave the same marks to Warma (QR Marc – Waresa/Empres) bred by Falborek Arabians and owned by Krzysztof Gozdzialski. Warma lost to Euspirią by lower type scores. It was now the stallions’ turn in the ring. Among the six contestants in the 4-6 year old stallions class the winner was Psyche Keret (Khidar - Psyche Victoria/Ekstern) bred and owned by S.K. Chrcynno – Pałac. His total of 91.75 gave him clear victory in the class. The runner up was Feuer Jade (Ajman Moniscione - Neva Bint Volga/Pamour) with a score of 91.38 and the second runner up Michałów’s Złoty Medal (QR Marc - Zlota Orda/Pesal) (90.38 points). 7 year old and older stallions gave a real show. The ring was filled with the quintessence of Arabian beauty. The quality of the stallions was quite extraordinary. 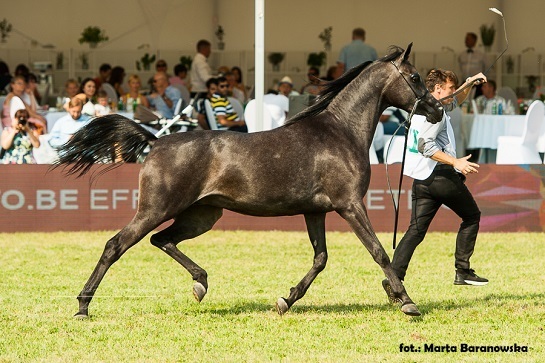 However, there could be only one winner, and this time the crown went to the magical Aja Angelo (Wh Justice - Aja Aaisha / Ruger AMW) bred by Al Baydaa Stud and owned by Aja Arabians. The judges gave him 92.13 points including very high marks for type (one „20” and 3 x 19.5). It must be admitted that the stallion has an “angelic” quality which makes it difficult to take one’s eyes off him. The second place was given to Muranas Jassehr (Major - Jana El Bri/ CH El Brillo) bred and owned by the Murana Stud with a score of 91.25 pkt. The third place went to Michałów’s Kabsztad (Poganin – Kwestura/ Monoramm) (91.00 points). The fourth and fifth place went to Girlan – Bey (Pesal – Gracja-Bis/ Monorgamm) and Emarc (QR Marc – Eksterna/ Ekstern) respectively. The results of the finals were no surprise. In the yearling fillies class the podium was shared by Aj Nurai (gold), Poganinka (silver) and Manaret Babel (bronze). The unanimous Champion of yearling colts was Cyclone OS. The silver medal went to El Shaad and the bronze to Elidus. 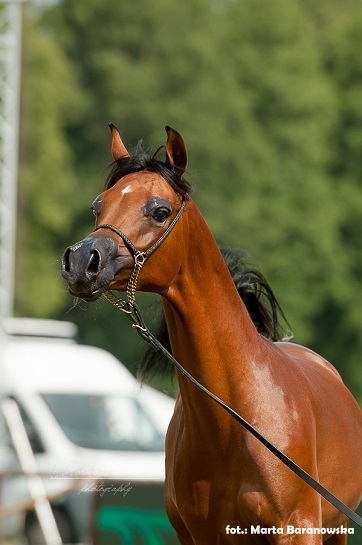 The champion of junior mares was Aj Sawari, who additionally won the title of Best in Show. The title of Vice-Champion was awarded to Al Moluk and the bronze medal to Wasalia. In the junior stallions championship we finally saw the long awaited (and the only) gold medal for a Polish-bred stallion, Fuerte. The second place on the podium went to Shiraz de Lafon and the third to Calateon. 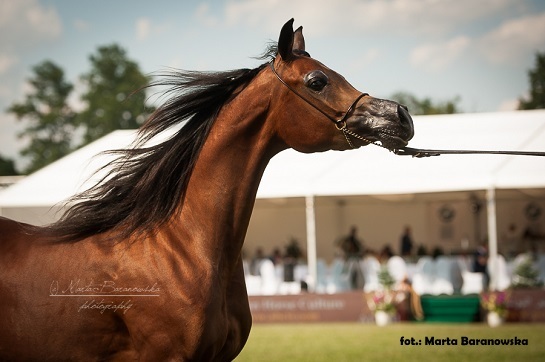 Another mare to leave Nowe Wrońska with the title of Champion was Felicia RLC. The silver medal went to Inspired Najla and the bronze to the delightful Wieża Mocy. In the senior stallions championship the judges were in agreement and all pointed to AJA Angelo. The second place and silver medal was awarded to Muranas Jassehr, who was joined by Psyche Keret with bronze. We remember the first edition of the Festival organized in Nowe Wrońska very well indeed, as it was a debut at the highest level. We now saw the third edition, which will be equally well remembered. The organizers continue to do all it takes to make sure that the show fulfills the expectations of the participants as well as the audience. All comments and suggestions offered in the questionnaires distributed during the show are carefully considered. The high quality of presented horses makes the Al Khalediah European Arabian Horse Festival one of the show which you simply have to attend.